Nigerian Billionaire, Michael Adenuga’s son, Paddy, took to social media to explain how he lost a lady very dear to him due to his youthfulness and foolishness. The heartbroken young man took to his Twitter account to recount his loss. According to him, all she ever wanted was his time and care, but he was too young to appreciate it, and he now misses her dearly and wishes things had been different. “Once upon a time i met a young woman that loved me completely.. all she ever wanted was my time and candy percy pig to be exact. . Here are some facts about him. 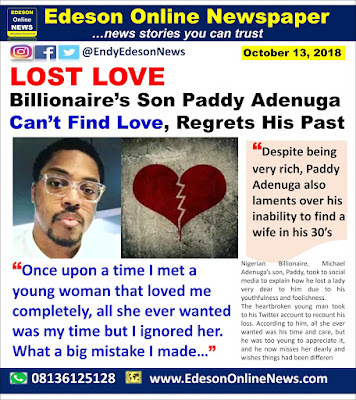 Paddy was born Mike Agbolade Adeniyi Ishola Paddy Adenuga in London, England at the St. Thomas Hospital on June 21, 1984. At the age of 10, he was relocated to Harlingen, Texas, USA in the Rio Grande Valley to attend the prestigious Marine Military Academy (MMA). Still at the age of 13, Mike Adenuga Jnr. started tertiary education at the University of Massachusetts, Boston studying Business Administration but graduated at Northeastern University in 2002 with a Bachelors in Business Management at the age of 18. From then on, he worked at family owned conglomerate, the Mike Adenuga Group, till 2006. He was the Group Executive Director of the Group’s telecom division known as GLO and also the upstream exploration & production company, ConOil Producing. In 2006, he left the Mike Adenuga Group and moved to London to setup an oil brokering firm with a business partner called Cayne & Cayne. Cayne & Cayne brokered supplies of refined petroleum product to Nigerian oil firms. GUYS, WHAT DO YOU THINK OF HIM NOT FINDING A WIFE DESPITE HIS WEALTH? @Charles, It's funny rich guys seek attentions too. One would think it's only hustling guys that do that. @Priceless: ha! hmmm he is too intelligent and matured to detect a good woman now. @Wonders: Really? Haven't you fallen in love before? I pray he finds one sha, fine guy like him. Money can never buy geniune happiness but time and attention can. He should think smart.